I've been using a Trivoli Humidor with a Cigar Oasis Plus. I noticed my CO running frequently and had to add water about once a week. 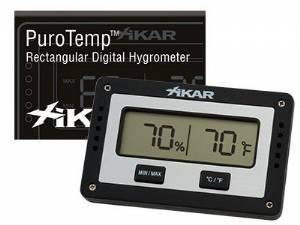 Xikar Puro Temp Rectangular Digital Hygrometer Discounts Apply ! Min/ Max feature displays lowest minimum and highest maximum humidity recorded over the life of the battery or until reset. This unit will read humidity in the range of 20% to 95%. Should the relative humidity be outside this range, the unit will show two dashes (- -). This simply means the humidity is outside the readable range. This unit will read humidity most accurately in the 60-80% range. XIKAR hygrometers are manufactured following strict standards for years of trouble free operation. However, if you find that the screen does not turn on, remove the battery by opening the cover located on the back of the unit. Make sure the battery is installed properly and makes contact with the silver metal contact. If the unit will not turn on, replace the battery. XIKAR hygrometers have used various battery sizes over the years. To ensure you purchase the right battery for your hygrometer, check your specific unit. For equivalent batteries sizes, see below. Follow each link for a complete list of compatible batteries.